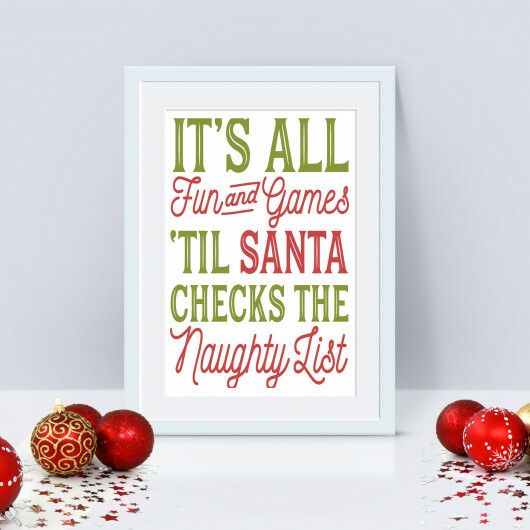 Add a personal touch to your home this Christmas with our personalised naughty list print. Gorgeous soft coloured print which makes a great house warming present when you first move into together or buy your first new home. Fun and lovely print for any family this Christmas, buy for yourself or as a lovely gift for Christmas. The print comes unframed as standard. You can opt for the A4 print when framed is framed within either a black and white frame in a frame that measures 30 x 40 cms, giving a beautiful framed larger size.